Looking To Brightening Your Smile? Maybe you’ve been there before—you’re washing your hands in the restroom and you look up to check your smile before heading out—but you suddenly notice your teeth aren’t as bright as they used to be! At Women in Dentistry, we’re happy to offer teeth whitening Melbourne CBD services to our patients who are looking to brighten their smile. Here’s how it works! Teeth whitening is an entirely non invasive treatment that is completed in the convenience of our own practice, unless you opt to do it at home. If you elect to whiten in our office with your dentist Melbourne CBD, the entire process takes just 90 minutes and is quite painless. Some patients do, however, report a slight tingling feeling that should disappear by the evening hours. So, how does teeth whitening work? We use a special light-activated treatment that can brighten your pearly whites 5-7 shades in just one visit. In-office whitening is recommended for patients who are looking for a fast and effective approach to brighten their smile. Though whitening mouth rinses and toothpastes can have a brightening effect, it can take weeks or months to notice a difference, and the results will not be as great as treatment by a dentist. If you’re ready to learn more about teeth whitening Melbourne CBD, contact our practice today to book your appointment. 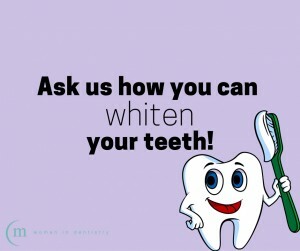 We’d be happy to discuss pricing with you then or other teeth whitening products that may be best suited for your needs.